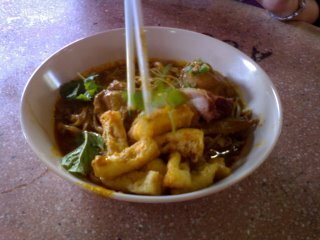 The Checkered Life: Curry Mee @ Ming Tian, Taman Megah. Curry Mee @ Ming Tian, Taman Megah. This time around i'm introducing to you the best curry mee i have eaten so far! Anyways presenting to you, curry mee @ "Ming Tian", Taman Megah! You can't miss the stall with its big words of "Curry Mee & Ipoh Hor Fun" amongst the many other stalls at this wonderful food court! What is good bout this stall is that it offers a variety of noodles to choose from, from your standard bihun, kuey tiao, yellow mee to "wan tan" kinda mee, Shanghai mee (mmm i think dats wat it is called... cant be sure) and lots more! Ok! The one above here is the dried curry mee! Available in small (RM4) and big (RM5) portions! IMHO, the dried style is the best as it is much spicier than the soup one !!!!!! Besides that i give it five thumbs up for presentation! They actually serve the mee topped with big chunks of chicken, char siew, "siew yok" (roasted pork)! and sprinkled with mint leaves! YuMMy! Although its a bit sinfully fattening.... but as the saying goes "we live to eat, eat to live!" yeah! Back to the topic, once u dig in... the aroma is also nice and the curry is not that oily too... unlike the many curry mee i have tried before! Word of advice though... the BIG size one may a bit too big for some stomachs to handle.... but then again the SMALL one won't satisfy a growling stomach! @_@" But no worrries.... plenty of other stalls to order additional food! 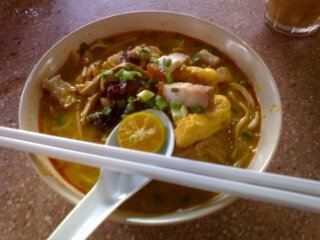 Now, this one is the soup curry mee! Eventhough it is not as spicy as the dried one... it is still good... the lime adds a delicious limey sour touch to the curry... and whats more, makes it more aromatic, too! It is served with the same type of ingredients (chicken, char siew, etc)! Anyways thats all for now, i heard from my frens that there is even a better curry seafood mee near jalan ipoh... or wuz it segambut..... ???? I 4got =_=''... Will update, when i find out! Anyways, just cant to wait to go out again and enjoy food when you're back! So quick quick come back.... !!!! wei good luck with your blog. you know i didn't want to say anything but you're so scary i thought i'd better do as you ask. anyways, the best curry mee is in segambut. the best ever! go find it! uhhhh...sorry ah no directions, but ask around man it's wicked. I tried one shop's curry noodle. the gravy was thick n it has a strong aroma. Very tasty! N its really easy to find, its called rest K-Poh. Hahaha. weird rite? 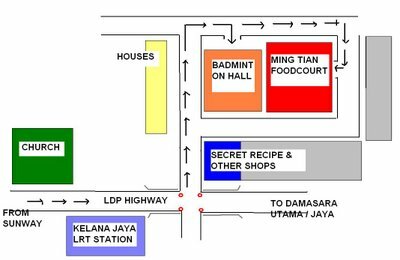 anyway, its in Kepong, Aman Puri.